Posted by Bianca Stawiarski, Transformational Coach on 17/05/2018. From 14 to 20 May 2018, Equestrian Australia is running a Mental Health Awareness Week within the equestrian community on social media platforms. Stay tuned with the hashtag #MentalHealthAwarenessWeek and feel free, like others to share YOUR story. Current statistics recognise one out of every 4 or 5 people has a mental health issue in Australia. Chances are you know someone, you have had or currently suffer from a mental health issue. Because of this, it is important that the stigma and lack of knowledge surrounding mental health are improved. Our body is designed to naturally and subconsciously adjust through our nervous systems and hormone levels to achieve homeostasis or an internal equilibrium. Our Sympathetic Nervous System operates unconsciously controlling our flight, fight or freeze response. It functions to keep us safe and preserve homeostasis. Some clues that your sympathetic nervous system is activated are: your mouth becoming dry; your heart rate increases, you feel nauseated, and you may have the overwhelming feeling of just needing to get out of the situation. Our parasympathetic nervous system is called the “rest and digest” function, also unconsciously regulating the body’s internal balance. Clues your parasympathetic nervous system is activated is that your heart rate decreases and you feel relaxed and calm. As mentioned above, both the sympathetic and parasympathetic nervous systems work to keep us safe, alive and thriving. Debilitating issues such as Anxiety and Post Traumatic Stress Disorder, to name two, may mean in a simplistic way that the Sympathetic Nervous System is heightened, without the equally regulating balance of the parasympathetic nervous system operating as it should. People may display symptoms of hypervigilance and anxiety. A considerable number of people have heard of Equine Assisted Learning and Equine Assisted Psychotherapy and how these programs can assist, improve and transform people’s experience of mental health. Horses have the innate ability to regulate their emotions and stress levels. They are masters of awareness – constantly scanning for changes in the environment that may signal a threat (or food). If horses get a fright, they generally get very alert, race around, then stop, do a big snort or out breath and go back to grazing. Imagine if we were able to regulate ourselves like a horse! Horses can assist us to recognise what is considered less desirable emotions such as anger, sadness and fear as well as more desirable emotions such as joy. All emotions are equally important, neither more nor less desirable than the other as they show us another part of being truly alive and in the present. Working in mutually beneficial partnership with horses, we can be resourced to experience and regulate our emotions, while developing social and emotional resilience. There is a unique, almost mystical transformation that occurs when a rider shoots a bow from a horse. The rider must be very mindful of their emotional regulation, how this impacts their horse, expending energy on inner awareness, promoting homeostasis. Consciously focusing on inner awareness and emotional regulation as an active process is not something that we usually tend to do. As mentioned above, spending this time is the first step towards positive wellbeing and good mental health. This is further expanded upon when we remove the rider's reliance on the reins. As a rider, having our hands on the reins is a structured skill of control. Those two thin strips of leather or webbing create an illusion of having control. This taps into our primitive Limbic system (that which keeps us safe, controls our emotions, behaviour, long-term memory etc). Dropping the reins is almost like a shock - both freeing and scary all at the same time. If done sensitively, we then discover that there is a depth of emotional resilience that we may not have realised we had. The exhilaration of being free taps into a well inside of us that can be dampened down in daily life. 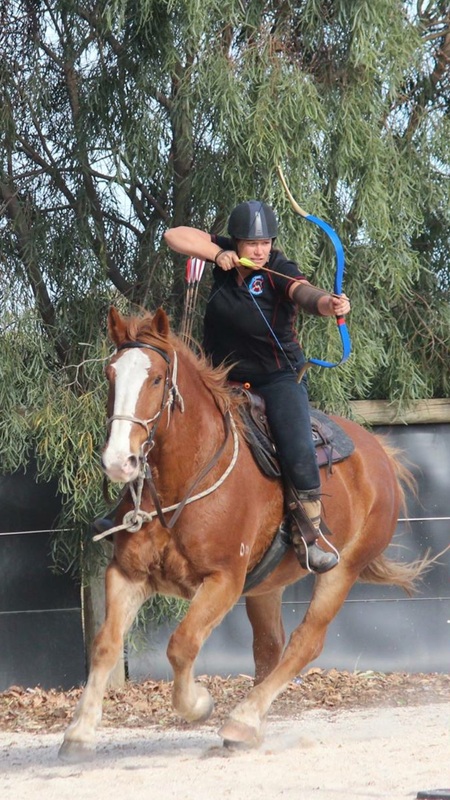 Finally, the connection with our inner primal strength of presence is consolidated through focusing on a target while moving, the muscular tension prior to releasing the arrow and the wonderful experience that partnership with a horse brings. All of this promotes emotional resilience, good mental health and partnership with another. This Mental Health Awareness Week considers how you can sensitively and respectfully partner with your horse, learning from their example of regulating emotion by “being horse”.